Important Bird and Biodiversity area (IBA) are areas identified using an internationally agreed set of criteria as being globally important for the conservation of bird populations. To be listed as an IBA, a site must satisfy at least one of this three criteria : Globally threatened species, restricted-range species (European importance), Biome-restricted species (importance in the European Union). This areas are designated by the Bird Directive (Council Directive 79/409/CEE of 2 april 1979 on the conservation of wild birds). Most of the Vigueirat Marshes are part of the IBA Marais entre Crau et Grand Rhône (PAC 08), except the lands north of the Etourneau site. This IBA, created in 1991, covers 5 650 hectares in the County of Arles, Port-Saint-Louis-du-Rhône and de Fos-sur-Mer. 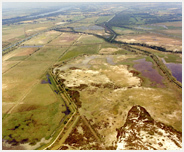 In addition, it includes the Meyranne Marshes, the Chanoines and former Caban Salt Marshes. This area is composed by marshes, ponds and rivers, salt marshes, reed beds and riverine forests. There is also a significant number of wintering and migrating birds : Eurasian bittern, Squacco heron, Great egret, Purple Heron, Red-crested pochard, Marsh harrier, black-winged stilt, Pied avocet, etc.